Brown University researchers have developed a new theory to explain why stretching or compressing metal catalysts can make them perform better. The theory, described in the journal Nature Catalysis, could open new design possibilities for new catalysts with new capabilities. Research in recent years has shown that applying a strain to metal catalysts—either compression or tension—can in some cases change the way they perform. Peterson and his team showed that molecules bound to a catalyst's surface will tend to either push atoms in the lattice apart or pull them closer together, depending upon the characteristics of the molecules and the binding sites. The different forces produced by molecules have interesting implications for how external strain should affect a catalyst's reactivity. It suggests that tension, which stretches a catalyst's atomic lattice, should make a catalyst more reactive to molecules that naturally want to push the lattice apart. At the same time, tension should decrease reactivity for molecules that want to pull the lattice together. Compression—squeezing the lattice—has an inverse effect. Those scaling relations cause troublesome tradeoffs when trying to optimize a catalyst. Getting the perfect reactivity for one chemical could cause another chemical to bind too tightly (or too loosely), potentially inhibiting some stages of a reaction. 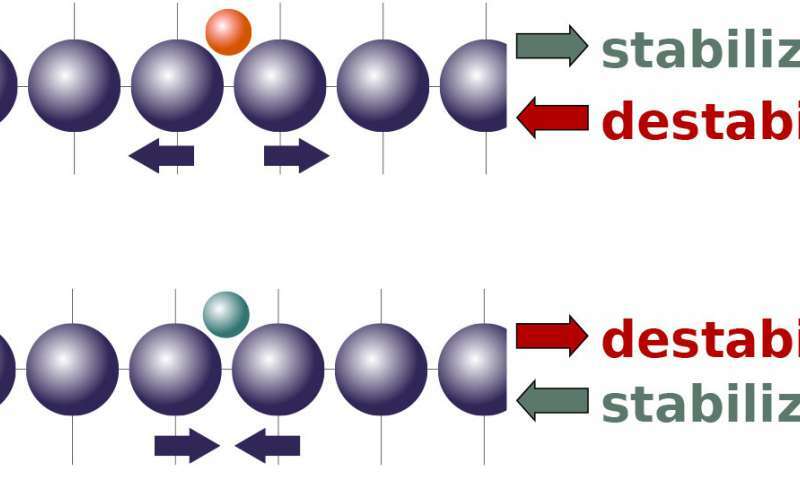 But this new theory suggests that strain can break those scaling relations—enabling a catalyst to simultaneously bind one chemical more tightly and another more loosely, depending on the chemical's natural interaction with the catalyst's atomic lattice and the way that the strain field is engineered on the catalyst surface.